St Mary Magdalene Church, Woolwich stands at the end of a spur of high ground, which reaches out northwards towards the River Thames. The churchyard is now maintained by the London Borough of Greenwich as a public garden. The church was built between 1727 and 1739. The builder was Matthew Spray, however the designer is not known. The church is Grade B listed. The church originally consisted of a nave with galleried aisles and a western tower. The Chancel, Sanctuary, Organ Chamber, and Lady Chapel were added in the 19th century. The Chancel by J. O. Scott dates from 1894. The galleries and aisles were closed off to form offices and a cafeteria by Thomas Ford in 1961. New vestries were added and the crypt was converted into a Youth Club by Thomas Ford in 1965 and 1967 respectively. It is believed that there has been a church on this site since the 9th century or even earlier. The church that existed prior to the present one was located nearer the River Thames and in Elizabethan times, it had a spire. The spire eventually fell down, and this was the first sign that all was not well with the foundations. It is hardly surprising that the former church fell down as sand had been dug from the little hill on which the church had been built for many years to be used as ballast in the boats on the river. Money was obtained from a special fund dedicated to Queen Anne for building fifty new churches in London* and the present building was started in 1732. The church was completed in 1739 and dedicated on May 9, 1740. The original building extended only as far as the wall by the steps to the Choir and had a shallow recess for the altar. The altar was surrounded by wooden panels; and on these was painted: the Ten Commandments, the Lord’s Prayer, and the Apostles Creed, in gold lettering. In 1894 the Choir, Sanctuary, and Lady Chapel were added and the panels fitted around the Lady Chapel altar. The organ was installed by Harrison & Harrison in 1900 and has three manuals and foot pedals. It is considered to be one of the finest organs in the district. The finances for the pulpit were raised by public subscription to commemorate the Diamond Jubilee of Queen Victoria. This is one of only a few pulpits to be mounted on rails. The rails enabled the pulpit to be pushed aside during a Communion Service so that the congregation could see clearly what was happening at the high altar. At ‘preaching services’ the pulpit was pushed almost to the centre of the Chancel steps where the preacher could be seen and heard by everyone. There is a fine ring of eight bells in the tower; and the first recorded peel was in 1826. The bells were re-hung in 1936, and our architects advise us that we should re-hang them again as soon as possible, although this time lower down the tower in order to save it from going the same way as the earlier spire! This would be a major operation and a costly one, although it would be preferable to silencing the bells altogether. As you walk round the church, you will be aware that the galleries and the side aisles have been enclosed. This was done in the 1960’s in two stages, first, to create a coffee bar on the river side of the church and second, to create a meeting room/lounge on the garden side. This was thought necessary after the Council demolished the Old Rectory and the Rectory Room during the big clearance schemes of the 1960’s. Church Youth organizations met at St Mary’s Church School until the Inner London Education Authority declared that each group should pay £60.00 a night to meet there. This was an impossible amount to find, so the young people were transferred to other troop companies and packs in the area. A few years later, again because of Council clearance and rebuilding works, the Woolwich Council of Social Service’s lost its old house in Rectory Place, and the side aisles of the church were enclosed to make offices for this organization and another organization called ‘WELCARE’. WELCARE continues to have a base in Woolwich, although in another part of the town. At this time, an investigation was also made into the viability of enlarging the crypt - which was under the organ and the Sanctuary - to see if it could be used for youth activities. A small chapel that could be reached by steps had been excavated during the 1939-45 war, but this had headroom of only 5’ or less. The explorations found that the wall of the church did go down as deep as the outer Crypt, so the crypt was expanded under the east window. A flight of steps was added to give access to the Crypt from the church garden. A youth club and a folk club soon developed in the Crypt, and meetings took place there several evenings a week. The Senior Citizens’ Club quickly followed, and this continued to meet in the Crypt for 30 years. The Crypt is now used by the St Mary’s Under 5’s Crèche, which is run as an independent charity by full time staff and volunteers. The group meets five days a week, and serves the children of families that are in need of support and help. Over the years, many different groups have used the church rooms, many of them starting out from St Mary’s Church to help those in need and moving on when they needed more space. At the moment two organizations are based in the church. These are: Working with Words (working with young Downs Syndrome sufferers) and St Mary’s Under 5’s Crèche (working with pre-school children). In 1965, the Rev. Derek Baker and the congregation of St. Andrew’s Presbyterian Church, Woolwich came to share St Mary’s Church when their own building became unsafe. It was a case of a fully turned circle. For in 1662, the Rev. John Hawkes, the Rector of St Mary’s Church, walked out of St Mary’s to become the first Presbyterian Minister in Woolwich. St Andrew’s Church still had the bible that he had taken with him and this was re-bound to celebrate a ground breaking sharing agreement between the two churches in 1974. At first, St Andrew’s had a service each Sunday after the Anglican service, but it was soon decided to have a joint service once a month and finally it was decided to meet together every week. St. Andrew’s Church did not come to St Mary’s empty handed! The Nave Altar and the Celebrant and Preacher’s Chairs’ came with them. The ‘Burning Bush’ pulpit fall is from St. Andrew’s, as is the stone Font next to the steps to the Choir. The altar in the Lady Chapel also came from St. Andrew’s Church; and we have been delighted to make use of them all. In the 1970’s St Andrew’s Presbyterian Church joined the United Reformed Church, but continued to meet at St Mary’s. Sadly, due to declining numbers, St Andrew’s Church was dissolved in 2001. But good relations between our two denominations continue. At the front of the nave you will see a beautiful statue of St. Mary and the baby Jesus, in the Lady Chapel there is a small silver cross behind the altar, and in the chancel is a small wooden font. These all came from the Chapel of the famous British Hospital for Mothers and Babies, which was located in Samuel Street, Woolwich. The local maternity unit is now in the new Queen Elizabeth Hospital in Woolwich. There are many interesting brass and stone memorials in the Lady Chapel, including one dedicated to Emma Wholmes, who was the church’s organist for many years. One of Emma’s relatives was amongst the many people who were returning from a day trip to Sheerness on the Princess Alice’ pleasure steamer on the 3 September 1878, when a collision occurred with a collier vessel, the Bywell Castle, a little way down the river from the Woolwich Ferry. Five hundred and ninety-one people died in the collision, and a stain glass window and brass plaque is dedicated to their memory in the room to the right of the nave near the main door of the church. The last memorial to be placed in the Lady Chapel is dedicated to Henry Maudsley, the great engineer. Henry designed his own tomb and was buried in it. It is near the footpath towards the river. When some work had to be done in that area of the churchyard some years ago, the Maudsley Society removed the tomb and put a new memorial in the Lady Chapel. St. Mary’s Church has a huge coat of arms on the wall of the entrance porch. Also in the porch, are lists of the previous Rectors of Woolwich and of the ministers of St. Andrew’s Presbyterian Church. On the outside of the church, on the south side, there is a sundial, but sadly this has folded against the wall, and, because of the large trees nearby, very little sun gets through to help us tell us the time! If you carry on to the east end of the church, you will see the entrance to the crypt and below the east window a plaque dating back to 1894. Turning towards the river, you cannot fail to see the large stone lion at the end of the path to your right. It is a memorial to Tom Cribb, the famous bare fist fighter. The memorial was paid for by public subscription. When Tom retired from the ring, he went to live with a son who had a bakery just along Woolwich High Street. Many headstones from the graves in the churchyard were repositioned against the wall of the churchyard when the care of the gardens was handed over to the Borough Council. The Council still looks after the garden today, and they have made it into a little oasis amid all the blocks of flats in the area. The churchyard still belongs to the church; and underneath the pleasant gardens still exist the hundreds of graves of those buried in previous centuries. At the front of the church is a Calvary, which used to stand at the corner of Beresford Square, Woolwich, outside Holy Trinity Church. This church was demolished under a road widening scheme in the 1960’s, soon after the Parish of Holy Trinity was united with that of St Mary’s. Much of the money paid in compensation for the demolition of the church was used to pay for the developments to St Mary’s Church in the 1960’s during the incumbency of the Rev. Nicolas Stacey. 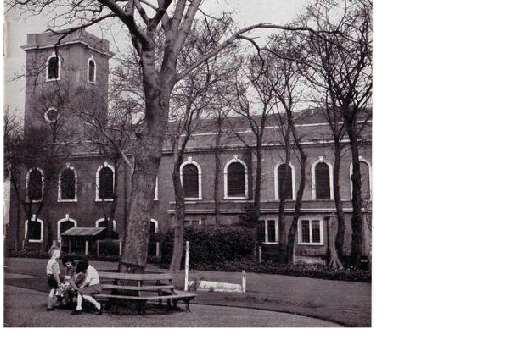 In the 1970’s, the former Parish of St Michael and All Angels was added to the Parish of Woolwich. Hence, the present Parish of Woolwich is now an amalgam of these three former parishes.